9 Reasons To Eat Cucumber Every Day! Cucumber. Even its name sounds cool, crisp, and refreshing! Not only are cucumbers delicious and nutritious, they are loaded with essential vitamins and minerals, such as: vitamin K and C, some B vitamins, copper, potassium, and manganese, all of which can help revitalize your health! This squash is definitely something you want to incorporate into your diet as much as possible. You won’t regret it. Cucumbers contain an anti-inflammatory flavonal called fistein that has been shown to play a crucial role in promoting brain health. It is known to improve memory and even protect your nerve cells from declining due to aging, and fisetin has also been found to prevent learning and memory impairments in mice with alzheimer’s disease. Cucumbers are loaded with antioxidants, including vitamin C and beta-carotene. They also contain antioxidant flavonoids like quercetin, apigenin, luteolin, and kaempferol. Quercetin is an antioxidant that has been shown to prevent histamine release, making it a natural antihistamine. Kaempferol can help fight cancer and lower your risk of heart disease. Cucumbers can literally help “cool” the inflammatory response system in your body. Some studies conducted on animals found that cucumber extract helps to reduce unwanted inflammation partially by inhibiting activity or pro-inflammatory enzymes. Cucumbers contain polyphenols called lignans, which can help lower your risk of various cancers such as breast, uterine, ovarian, and prostate. They also contain phytonutrients called cucurbitacins (great name) which also have anti-cancer properties! Cucumbers are loaded with fiber and water, two of the most essential elements that are needed for optimal digestive health. Cucumbers may help to raise the stomach pH, which can assist with symptoms of acid reflux. Also, the skin on cucumbers contains insoluble fiber, which can add bulk to your stool, assisting food to move through your digestive tract quickly and thereby promoting healthy elimination. If your breath is a little on the stinky side, you can freshen it up by placing a slice of cucumber on the roof of your mouth. This will help help rid your mouth of odor-causing bacteria. According to Ayurveda, eating cucumbers can also help to release any excess heat in your stomach, which is believed to be a primary cause of bad breath. Cucumbers contain an assortment of B vitamins including vitamin B1, B5, and B7. B vitamins are known to help ease anxiety and reduce the damaging effects of stress. 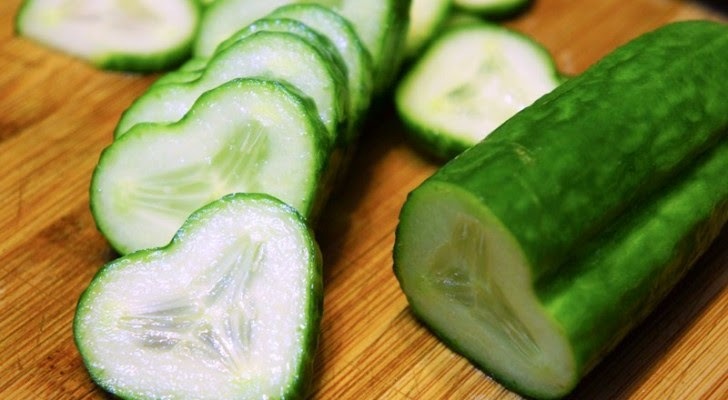 Cucumbers are extremely low in calories, but extremely high in nutrients, so they make a filling and healthy snack. When cucumbers are digesting they dissolve into a gel-like texture which helps to slow down digestion, helping you feel full for longer. This is why fiber rich foods are great for weight management. Because cucumbers contain potassium, they can assist with lowering blood pressure. Potassium is an electrolyte, and its functions assist with interacting with sodium to help control nerve impulse transmission, muscle contraction, and heart function. If these are not enough reasons to start eating more cucumbers, then I guess you must really not like them! Be sure to get organic when possible. You can enjoy slices of cucumber in your water, juice it with other veggies, add it to your salad, and just eat it straight up! Its great in the summer, but can definitely be enjoyed all year round. Enjoy!